Made from fresh Atlantic fish remains. Made by a unique cold process that protects the vitamins, amino acids and enzymes. Contains all the micro and macro nutrients naturally found in fish. Contains proteins and oils. No unpleasant odor. 9-0-0 Produces a lush, green lawn. Non burning, slow releasing. People and pet friendly. Will not leach into water. 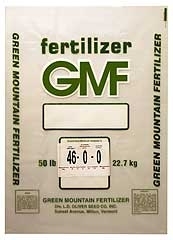 An excellent fertilizer for rapid growth and green color. Scotts Turf Builder Winterguard Fall Lawn Fertilizer protects and strengthens your grass in the cold season for a better spring lawn. This fertilizer works beautifully with any grass type, and includes Scotts premium Water Smart formula to improve your lawn's ability to absorb water and nutrients. 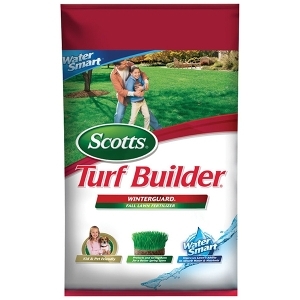 Scotts Turf Builder Winterguard Fall Lawn Fertilizer is strong enough to do the job, but it's also kid and pet-friendly. This bag covers 15,000 sq. ft.